From Monday 16 July to Monday 13 August have your say on plans for the new Halifax leisure centre. Click here to take part in the survey and help shape the plans. Exciting, new leisure facilities in Halifax. Currently, Halifax has two town centre sports provision sites, Halifax Swimming Pool and North Bridge Leisure Centre. Both facilities are dated and require significant ongoing maintenance to continue to operate. To ensure the future provision of modern leisure facilities in the town, the Council has been exploring a number of options for the construction of a new facility in the town centre to meet the needs of the community. 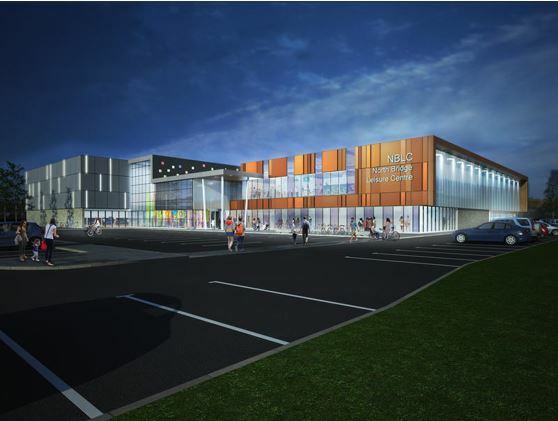 A feasibility study concluded that a new combined swimming pool and leisure facility on the existing North Bridge site would provide the most cost effective solution, by incorporating the existing main sports hall and viewing balcony. Work is currently progressing on the detailed design, construction and consultation requirements and we will commence a stakeholder consultation process from July to August 2018 to ensure that those who are using the facilities will benefit from them. Grow the economy – Contribute to the wider regeneration of Halifax town centre as part of an improved retail and leisure offer. Reduce inequality – Reduce health inequalities throughout the Borough by providing sustainable leisure facilities which are more accessible to residents in areas with poor health outcomes. Modernise the Council – Increase productivity by addressing the current demand for leisure activities, reducing unused spaces, dealing with the existing maintenance backlog and achieving greater energy efficiency. This entry was posted in Local News on July 19, 2018 by calderdaleforum50plus.